This article is about the species commonly called "giant sequoia". For the species commonly called "coast redwood", see Sequoia sempervirens. For other uses, see Sequoia (disambiguation). Sequoiadendron giganteum (giant sequoia; also known as giant redwood, Sierra redwood, Sierran redwood, Wellingtonia or simply big tree—a nickname also used by John Muir ) is the sole living species in the genus Sequoiadendron, and one of three species of coniferous trees known as redwoods, classified in the family Cupressaceae in the subfamily Sequoioideae, together with Sequoia sempervirens (coast redwood) and Metasequoia glyptostroboides (dawn redwood). Giant sequoia specimens are the most massive trees on Earth. The common use of the name sequoia usually refers to Sequoiadendron giganteum, which occurs naturally only in groves on the western slopes of the Sierra Nevada Mountains of California. Giant sequoia specimens are the most massive individual trees in the world. They grow to an average height of 50–85 m (164–279 ft) with trunk diameters ranging from 6–8 m (20–26 ft). Record trees have been measured at 94.8 m (311 ft) tall. Trunk diameters of 17 m (56 ft) have been claimed via research figures taken out of context. The specimen known to have the greatest diameter at breast height is the General Grant tree at 8.8 m (28.9 ft). Between 2014 and 2016, specimens of coast redwood were found to have greater trunk diameters than all known giant sequoias. The trunks of coast redwoods taper at lower heights than those of giant sequoias which have more columnar trunks that maintain larger diameters to greater heights. The oldest known giant sequoia is 3,500 years old based on dendrochronology. Giant sequoias are among the oldest living organisms on Earth. Giant sequoia bark is fibrous, furrowed, and may be 90 cm (3 ft) thick at the base of the columnar trunk. The bark provides significant protection from fire damage. The leaves are evergreen, awl-shaped, 3–6 mm (1⁄8–1⁄4 in) long, and arranged spirally on the shoots. The giant sequoia regenerates by seed. The seed cones are 4–7 cm (1 1⁄2–3 in) long and mature in 18–20 months, though they typically remain green and closed for as long as 20 years. 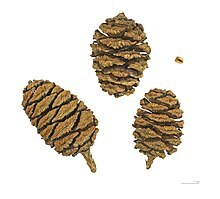 Each cone has 30–50 spirally arranged scales, with several seeds on each scale, giving an average of 230 seeds per cone. Seeds are dark brown, 4–5 mm (0.16–0.20 in) long, and 1 mm (0.04 in) broad, with a 1-millimeter (0.04 in) wide, yellow-brown wing along each side. Some seeds shed when the cone scales shrink during hot weather in late summer, but most are liberated by insect damage or when the cone dries from the heat of fire. Young trees start to bear cones after 12 years. 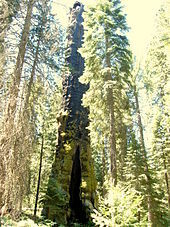 Trees may produce sprouts from their stumps subsequent to injury, until about 20 years old; however, shoots do not form on the stumps of mature trees as they do on coast redwoods. Giant sequoias of all ages may sprout from their boles when branches are lost to fire or breakage. A large tree may have as many as 11,000 cones. Cone production is greatest in the upper portion of the canopy. A mature giant sequoia disperses an estimated 300–400 thousand seeds annually. The winged seeds may fly as far as 180 m (590 ft) from the parent tree. Lower branches die readily from being shaded, but trees younger than 100 years retain most of their dead branches. Trunks of mature trees in groves are generally free of branches to a height of 20–50 m (70–160 ft), but solitary trees retain lower branches. 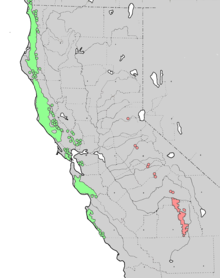 The natural distribution of giant sequoias is restricted to a limited area of the western Sierra Nevada, California. They occur in scattered groves, with a total of 68 groves (see list of sequoia groves for a full inventory), comprising a total area of only 144.16 km2 (35,620 acres). Nowhere does it grow in pure stands, although in a few small areas, stands do approach a pure condition. The northern two-thirds of its range, from the American River in Placer County southward to the Kings River, has only eight disjunct groves. The remaining southern groves are concentrated between the Kings River and the Deer Creek Grove in southern Tulare County. Groves range in size from 12.4 km2 (3,100 acres) with 20,000 mature trees, to small groves with only six living trees. Many are protected in Sequoia and Kings Canyon National Parks and Giant Sequoia National Monument. The giant sequoia is usually found in a humid climate characterized by dry summers and snowy winters. Most giant sequoia groves are on granitic-based residual and alluvial soils. The elevation of the giant sequoia groves generally ranges from 1,400–2,000 m (4,600–6,600 ft) in the north, to 1,700–2,150 metres (5,580–7,050 ft) to the south. Giant sequoias generally occur on the south-facing sides of northern mountains, and on the northern faces of more southerly slopes. High levels of reproduction are not necessary to maintain the present population levels. Few groves, however, have sufficient young trees to maintain the present density of mature giant sequoias for the future. The majority of giant sequoias are currently undergoing a gradual decline in density since European settlement. Two giant sequoias, Sequoia National Park. The right-hand tree bears a large fire scar at its base; fires do not typically kill the trees but do remove competing thin-barked species, and aid giant sequoia regeneration. Giant sequoias are in many ways adapted to forest fires. Their bark is unusually fire resistant, and their cones will normally open immediately after a fire. The giant sequoias are having difficulty reproducing in their original habitat (and very rarely reproduce in cultivation) due to the seeds only being able to grow successfully in full sun and in mineral-rich soils, free from competing vegetation. Although the seeds can germinate in moist needle humus in the spring, these seedlings will die as the duff dries in the summer. They therefore require periodic wildfire to clear competing vegetation and soil humus before successful regeneration can occur. Without fire, shade-loving species will crowd out young sequoia seedlings, and sequoia seeds will not germinate. When fully grown, these trees typically require large amounts of water and are therefore often concentrated near streams. Fires also bring hot air high into the canopy via convection, which in turn dries and opens the cones. The subsequent release of large quantities of seeds coincides with the optimal postfire seedbed conditions. Loose ground ash may also act as a cover to protect the fallen seeds from ultraviolet radiation damage. In 1970, the National Park Service began controlled burns of its groves to correct these problems. Current policies also allow natural fires to burn. 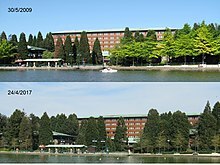 One of these untamed burns severely damaged the second-largest tree in the world, the Washington tree, in September 2003, 45 days after the fire started. This damage made it unable to withstand the snowstorm of January 2005, leading to the collapse of over half the trunk. The giant sequoia was well known to Native American tribes living in its area. Native American names for the species include wawona, toos-pung-ish and hea-mi-withic, the latter two in the language of the Tule River Tribe. The first reference to the giant sequoia by Europeans is in 1833, in the diary of the explorer J. K. Leonard; the reference does not mention any locality, but his route would have taken him through the Calaveras Grove. This discovery was not publicized. 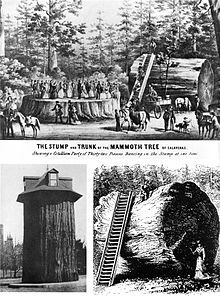 The next European to see the species was John M. Wooster, who carved his initials in the bark of the 'Hercules' tree in the Calaveras Grove in 1850; again, this received no publicity. Much more publicity was given to the "discovery" by Augustus T. Dowd of the Calaveras Grove in 1852, and this is commonly cited as the species' discovery. The tree found by Dowd, christened the 'Discovery Tree', was felled in 1853. The first scientific naming of the species was by John Lindley in December 1853, who named it Wellingtonia gigantea, without realizing this was an invalid name under the botanical code as the name Wellingtonia had already been used earlier for another unrelated plant ( Wellingtonia arnottiana in the family Sabiaceae). 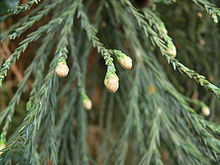 The name "Wellingtonia" has persisted in England as a common name. The following year, Joseph Decaisne transferred it to the same genus as the coast redwood, naming it Sequoia gigantea, but again this name was invalid, having been applied earlier (in 1847, by Endlicher) to the coast redwood. The name Washingtonia californica was also applied to it by Winslow in 1854, though this too is invalid, belonging to the palm genus Washingtonia. 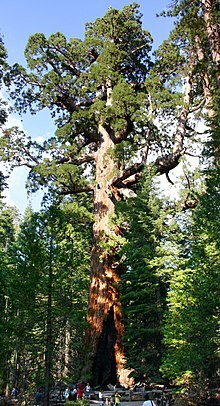 In 1907, it was placed by Carl Ernst Otto Kuntze in the otherwise fossil genus Steinhauera, but doubt as to whether the giant sequoia is related to the fossil originally so named makes this name invalid. The nomenclatural oversights were finally corrected in 1939 by J. Buchholz, who also pointed out the giant sequoia is distinct from the coast redwood at the genus level and coined the name Sequoiadendron giganteum for it. Wood from mature giant sequoias is highly resistant to decay, but due to being fibrous and brittle, it is generally unsuitable for construction. From the 1880s through the 1920s, logging took place in many groves in spite of marginal commercial returns. The Hume-Bennett Lumber Company was the last to harvest giant sequoia, going out of business in 1924. Due to their weight and brittleness, trees would often shatter when they hit the ground, wasting much of the wood. Loggers attempted to cushion the impact by digging trenches and filling them with branches. Still, as little as 50% of the timber is estimated to have made it from groves to the mill. The wood was used mainly for shingles and fence posts, or even for matchsticks. The wood from immature trees is less brittle, with recent tests on young plantation-grown trees showing it similar to coast redwood wood in quality. This is resulting in some interest in cultivating giant sequoia as a very high-yielding timber crop tree, both in California and also in parts of western Europe, where it may grow more efficiently than coast redwoods. In the northwest United States, some entrepreneurs have also begun growing giant sequoias for Christmas trees. Besides these attempts at tree farming, the principal economic uses for giant sequoia today are tourism and horticulture. Giant sequoia is a very popular ornamental tree in many areas. It is successfully grown in most of western and southern Europe, the Pacific Northwest of North America north to southwest British Columbia, the southern United States, southeast Australia, New Zealand and central-southern Chile. It is also grown, though less successfully, in parts of eastern North America. Trees can withstand temperatures of −31 °C (−25 °F) or colder for short periods of time, provided the ground around the roots is insulated with either heavy snow or mulch. Outside its natural range, the foliage can suffer from damaging windburn. The tallest giant sequoia ever measured outside of the United States  is a specimen planted near Ribeauvillé in France in 1856 and measured in 2014 at a height between 57.7 m (189 ft)  and 58.1 m (191 ft)  at age 158 years. The giant sequoia was first brought into cultivation in Britain in 1853 by the horticulturist Patrick Matthew of Perthshire from seeds sent by his botanist son John in California. A much larger shipment of seed collected from the Calaveras Grove by William Lobb, acting for the Veitch Nursery near Exeter, arrived in England in December 1853;  seed from this batch was widely distributed throughout Europe. Growth in Britain is very fast, with the tallest tree, at Benmore in southwest Scotland, reaching 56.4 m (185 ft) in 2014 at age 150 years,  and several others from 50–53 m (164–174 ft) tall; the stoutest is around 12 m (39 ft) in girth and 4 m (13 ft) in diameter, in Perthshire. The Royal Botanic Gardens at Kew in London also contains a large specimen. Biddulph Grange Garden in Staffordshire holds a fine collection of both Sequoiadendron giganteum and Sequoia sempervirens (coast redwood). The General Sherman of California has a volume of 1,489 m3 (52,600 cu ft); by way of comparison, the largest giant sequoias in Great Britain have volumes no greater than 90–100 m3 (3,200–3,500 cu ft), one example being the 90 m3 (3,200 cu ft) specimen in the New Forest. Growth rates in some areas of Europe are remarkable. One young tree in Italy reached 22 m (72 ft) tall and 88 cm (2.89 ft) trunk diameter in 17 years (Mitchell, 1972). Growth further northeast in Europe is limited by winter cold. In Denmark, where extreme winters can reach −32 °C (−26 °F), the largest tree was 35 m (115 ft) tall and 1.7 m (5.6 ft) diameter in 1976 and is bigger today. One in Poland has purportedly survived temperatures down to −37 °C (−35 °F) with heavy snow cover. The oldest sequoiadendron in the Czech Republic, at 44 m (144 ft), grows in Ratměřice u Votic castle garden. Giant sequoias are grown successfully in the Pacific Northwest and southern US, and less successfully in eastern North America. Giant sequoia cultivation is very successful in the Pacific Northwest from western Oregon north to southwest British Columbia, with fast growth rates. In Washington and Oregon, it is common to find giant sequoias that have been successfully planted in both urban and rural areas. In the Seattle area, large specimens exceeding 90 ft (27 m) are fairly common and exist in several city parks and many private yards (especially east Seattle including Capitol Hill, Washington Park, & Leschi/Madrona, as well as Tacoma's Jefferson Park). Sequoiadendron giganteum "Hazel Smith", photographed at the U.S. National Arboretum in September, 2014. A cold-tolerant cultivar 'Hazel Smith' selected in about 1960 is proving more successful in the northeastern US. This clone was the sole survivor of several hundred seedlings grown at a nursery in New Jersey. 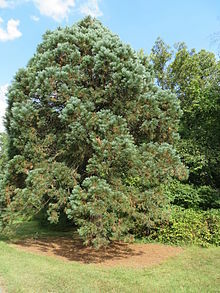 The U.S. National Arboretum has a specimen grown from a cutting in 1970 that can be seen in the Gotelli Conifer Collection. The Ballarat Botanical Gardens contain a significant collection, many of them about 150 years old. Jubilee Park and the Hepburn Mineral Springs Reserve in Daylesford, Cook Park in Orange, New South Wales and Carisbrook's Deep Creek park in Victoria both have specimens. Jamieson Township in the Victorian high country has 2 specimens which were planted in the early 1860s. In Tasmania specimens are to be seen in private and public gardens, as they were popular in the mid Victorian era. The Westbury Village Green has mature specimens with more in Deloraine. The Tasmanian Arboretum contains young wild collected material. The National Arboretum Canberra has begun a grove. They also grow in the abandoned arboretum at Mount Banda Banda in New South Wales. The Washington Tree was previously arguably the second largest tree with a volume of 47,850 cubic feet (1,355 m3) (although the upper half of its trunk was hollow, making the calculated volume debatable), but after losing the hollow upper half of its trunk in January 2005 following a fire, it is no longer of great size. tallest outside the United States:  specimen near Ribeauvillé, France, measured in 2014 at a height between 57.7 m (189 ft)  and 58.1 m (191 ft)  at age 158 years. ^ The volume figures have a low degree of accuracy (at best about ±14 cubic metres or 490 cubic feet), due to difficulties in measurement; stem diameter measurements are taken at a few set heights up the trunk, and assume that the trunk is circular in cross-section, and that taper between measurement points is even. The volume measurements also do not take cavities into account. The measurements are trunk-only, and do not include the volume of wood in the branches or roots. ^ Schmid, R. & Farjon, A. 2013. Sequoiadendron giganteum. In: IUCN 2013. IUCN Red List of Threatened Species. Version 2013.1. <www.iucnredlist.org>. Downloaded on 13 July 2013. ^ "Sequoia and Kings Canyon brochure" (PDF). National Park Service. Archived (PDF) from the original on 2016-10-26. Retrieved 2016-10-26. ^ a b "The Giant Sequoia National Monument". usda.gov. United States Department of Agriculture - Forest service. Archived from the original on November 19, 2018. Retrieved December 6, 2018. ^ a b Sierra Nevada - The Naturalist's Companion. University of California Press. 1 June 2000. p. 55. ISBN 978-0-520-92549-6. ^ a b Lowe, Gary D. (2012). "Endlicher's Sequence: The Naming of the Genus Sequoia" (PDF). cnps.org. California Native Plant Society. p. 33. Retrieved January 15, 2017. ...the foregoing has shown that the name of the genus Sequoia as a tribute to the Cherokee linguist Sequoyah is an unsubstantiated opinion...Endlicher named the genus for the operation that he had conducted. The new genus fell in sequence with the other four genera in his suborder. ^ Flint, Wendell D. (1987). To Find the Biggest Tree. Sequoia National Forest Association. p. 94. ^ Vaden, M.D. "Coast Redwood Discovery. Sequoia sempervirens". ^ Masters, Nathan (21 May 2014). "These Sequoia Trees Are Thriving 175 Miles South of Their Natural Range". Gizmodo. Retrieved April 15, 2018. ^ Stephens, Scott; Finney, Mark (2002). "Prescribed fire mortality of Sierra Nevada mixed conifer tree species: effects of crown damage and forest floor combustion". Forest Ecology and Management. 162 (3): 261–271. doi: 10.1016/S0378-1127(01)00521-7. ^ Hartesveldt, RJ; Harvey, HT (1967). "The Fire Ecology of Sequoia Regeneration" (PDF). Tall Timbers Fire Ecology Conference. 7: 7. ^ Ornduff, R. (1994). "A Botanist's View of the Big Tree". In Aune, P. S. Proceedings of the Symposium on Giant Sequoias (PDF). US Dept. of Agriculture Forest Service (Pacific Southwest Research Station). General Technical Report PSW-GTR-151. ^ Muir, John (November 1996). Gifford, Terry, ed. John Muir: His Life and Letters and Other Writings. Mountaineers Books. pp. 139–140. ISBN 0898864631. ^ "Battle against Rough fire intensifies as blaze bears down on Hume Lake". fresnobee. Retrieved 2015-10-18. ^ "Species Level Browse Results". NurseryGuide.com. Oregon Association of Nurseries. 2011. Archived from the original on 2012-03-09. Retrieved 2016-10-31. ^ a b "The thickest, tallest, and oldest giant sequoia trees (Sequoiadendron giganteum)". monumentaltrees.com. Retrieved August 2, 2015. ^ a b "Giant sequoia in the forêt domaniale de Ribeauvillé". monumentaltrees.com. Retrieved August 2, 2015. ^ a b "RIQUEWIHR/RIBEAUVILLÉ (68) : Forêt Domaniale de Ribeauvillé". Sequoias.eu. Retrieved August 2, 2015. ^ "The History of Cluny – The Plant Collectors". clunyhousegardens.com. Retrieved 23 December 2008. ^ Christopher J. Earle. "Sequoiadendron giganteum (Lindley) Buchholz 1939". University of Hamburg. Archived from the original on 2012-07-07. Retrieved 23 December 2008. ^ "Top Trunks". Redwood World. Retrieved September 19, 2013. ^ "RHS Plantfinder - Sequoiadendron giganteum". Retrieved 10 November 2018. ^ "AGM Plants - Ornamental" (PDF). Royal Horticultural Society. July 2017. p. 96. Retrieved 10 November 2018. ^ "Sequoie d'Italia". Retrieved January 22, 2014. ^ Puzović, B. (August 15, 2011). "Lazarevac: Visoke sekvoje niču iz uglja" (in Serbian). Novosti.rs. Retrieved September 17, 2013. ^ "Mansion and History". Blithewold Mansion, Gardens, and Arboretum. ^ "Gardens". Blithewold Mansion, Gardens, and Arboretum. ^ "Colorado giant sequoia". giant-sequoia.com. ^ "Michigan giant sequoia". Giant-sequoia.com. ^ "History". Rangiora High School. ^ a b c Cone, Tracie (2012-12-01). "Upon further review, giant sequoia tops a neighbor". Associated Press. Archived from the original on 2012-12-02. ^ a b Quammen, David. "Giant Sequoias". National Geographic. Aune, P. S., ed. (1994). Proceedings of the Symposium on Giant Sequoias. US Dept. of Agriculture Forest Service (Pacific Southwest Research Station). General Technical Report PSW-GTR-151. Flint, W.D. (2002). To Find The Biggest Tree. Sequoia Natural History Association, Inc. ISBN 1-878441-09-4. Mitchell, Alan (1972). Conifers in the British Isles. HMSO. Forestry Commission Booklet 33. Mitchell, Alan (1996). Alan Mitchell's Trees of Britain. HarperCollins. ISBN 0-00-219972-6. Harvey, H. T.; Shellhammer, H. S.; Stecker, R. E. (1980). Giant sequoia ecology. Scientific Monograph Series. 12. Washington, DC: U.S. National Park Service. Kilgore, B. (1970). "Restoring Fire to the Sequoias". National Parks and Conservation Magazine. 44 (277): 16–22. Zsolt Debreczy; Istvan Racz (2012). Kathy Musial, ed. Conifers Around the World (1st ed.). DendroPress. p. 1089. ISBN 9632190610. Chase, J. Smeaton (1911). Cone-bearing Trees of the California Mountains. Chicago: A. C. McClurg & Co. p. 99. LCCN 11004975. OCLC 3477527. Earle, Christopher J., ed. (2018). "Sequoiadendron giganteum". The Gymnosperm Database. Habeck, R. J. (1992). "Sequoiadendron giganteum". Fire Effects Information System (FEIS). US Department of Agriculture (USDA), Forest Service (USFS), Rocky Mountain Research Station, Fire Sciences Laboratory – via https://www.feis-crs.org/feis/. Hartesveldt, Richard J.; Harvey, H. Thomas; Shellhammer, Howard S.; Stecker, Ronald E. (1975). The Giant Sequoia of the Sierra Nevada. Washington, D.C.: National Park Service. 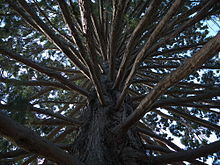 Wikimedia Commons has media related to Sequoiadendron giganteum. Wikisource has the text of the 1920 Encyclopedia Americana article Sequoia Gigantea. Redwoodworld.co.uk giant redwoods in the U.K.
Short radio episode Woody Gospel Letter in which John Muir extols "King Sequoia" from The Life and Letters of John Muir, 1924. California Legacy Project. "Sequoia" . Encyclopædia Britannica (11th ed.). 1911. Conifers Around the World: Sequoiadendron giganteum - Giant Sequoia.